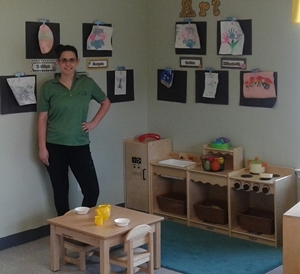 Meet Ms. Caroline, lead toddler teacher at The Children’s Courtyard in Pflugerville, TX. She was a nanny for nearly 10 years but knew she wanted to apply her passion for children to a classroom setting. She has been a member of the CCY team for nearly a year and has made a lasting impact on her students since then – read on to learn more about Caroline! Why did you decide to join The Children’s Courtyard team of teachers? I have always wanted to be around kids and teach kids, so I started as a nanny but I always wanted a classroom setting with lesson plans. I wanted to be in a bigger setting. I had a friend who worked at The Children’s Courtyard and I started working here and I absolutely love it! How is it rewarding to teach toddlers each day? Can you tell us what a typical day in your toddler classroom looks like? We have a very strict schedule in my classroom! I get here at 8 a.m. and that’s when we start breakfast. Everybody gets breakfast and by 8:30 a.m., we’re doing diaper changes and then we’ll go outside or to the soft motor room. Then we come back to the classroom and we do circle time for 15-20 minutes and do songs, ABCs, colors, shapes, all that stuff. Then we do an art project until about 10 a.m. In between 10 and 11 a.m. we do diaper changes and clean up from the art project. We do lunch at 11 a.m. As soon as they wake up we do another round of diaper changes, go outside or to the soft motor room. Most of the time, we do snack after that. Then we do another art project or activity like a sensory table. Afterwards, we have a little bit of free play and between 4 and 5:30 p.m. the kids start leaving. We stay on our strict schedule! Schedules are very important at that age. Oh yeah. I have to have my classroom organized. If it’s unorganized, the day doesn’t work out! Why is it important to build a strong educational foundation at a young age? These kids in our program are far more advanced. They have way bigger vocabularies and know all their colors and shapes at really young ages. It gets into their minds that learning is fun. Can you share a memorable moment you’ve had since teaching at The Children’s Courtyard? When the students first started to be able to say my name, that was so cute. That was one of my favorite things because now they can say “Ms. Caroline! Ms. Caroline!” Also, it was so good when they started to learn everybody else’s names. August will be your one-year anniversary of teaching The Children’s Courtyard. What has your experience been like so far? I’ve never ever had a moment where I wake up and I dread coming to work. It’s always “we’re going to have so much fun!” And I think every teacher here feels the same way. It makes everything go so much smoother and everyone is always happy. It’s a really fun place to work.